We understand that making the decision to surrender a pet is very difficult and we are committed to working with you to find the best possible solution for you and your pet. There are many reasons that might cause you to consider surrendering your pet. If you would like to keep your pet but need help solving a problem, we may be able to provide resources to help you keep your pet in your home. For more information about alternatives to surrendering your pet, please call us at (205) 397-8534. GBHS partners with an online rehoming service called Adopt a Pet where you can post your pet for adoption. Nobody knows your pet better than you! You can provide the best description of their personality and pictures of them in a home setting. Additionally, you would be most knowledgeable when talking to a potential new owner about whether the animal would be a good fit for them. 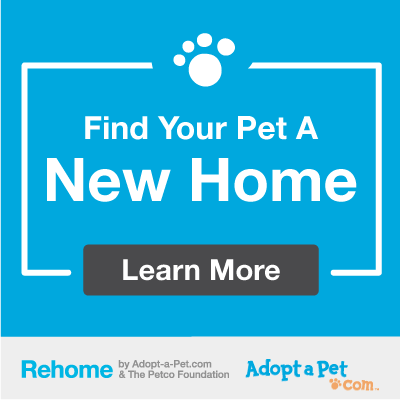 Rehoming your pet this way allows them to stay at home in comfortable surroundings while you select the home that you think will be the best for them. This also leaves one more opening at GBHS for those animals without someone to advocate for them. Ask local veterinarians if you can post signs in their clinic. Ask local pet-related businesses if you can post signs in their store. Talk to friends, relatives, neighbors and co-workers to see if they are looking for a pet. Place an ad in the paper. Pet Pantry clients must demonstrate need through income-based qualifications, as well as commit to helping reduce the burden on the community for uncared for animals by working with GBHS to ensure that their enrolled pets meet the minimum standards of care. Additionally, the pets in Pet Pantry are required to be altered within 3 months of enrolling, which reduces the number of unwanted and uncared for litters in our area. If you are in need of pet food assistance, you can fill out an application by clicking learn more below. If you decide that surrendering your pet to GBHS is the right option, please be aware that we follow a managed admission philosophy for all incoming animals. This means that we request all customers schedule an appointment before bringing an animal to our facility. Utilizing a managed admission process ensures we have the resources to give each animal the best care and accommodations we can provide and allows us to properly isolate, treat and prevent illness from spreading to at-risk populations. Managing the admission of animals helps us plan and prepare and allows us to save more lives. Customers surrendering a pet from outside Jefferson County must make an appointment and pay the corresponding out-of-county surcharge. The fees help GBHS ensure we are financially able to care for each pet that is surrendered to us and that we are addressing the needs of our community first. 1. Call (205) 397-8534 or email krawlings@gbhs.org to schedule an appointment. GBHS takes in all surrendered animals by appointment to ensure that we have the space and resources to best provide for every animal entering the shelter. 2. Bring all veterinary records to your appointment. This will ensure that your animal will not receive unnecessary vaccinations or procedures and will expedite their medical assessment. 3. Allocate 30 minutes at GBHS for your appointment. This will provide time to complete a personality profile so we can learn more about your pet’s temperament in the home. If you would like to save time at your appointment, please print and fill out a Personality Profile for your pet and bring it along to your appointment. 4. Bring the animal yourself. We will receive the most accurate information if you bring your pet in yourself. If you are unable to, we need written and signed consent from you naming another person to act as your agent and that you authorize this agent to bring the animal in on your behalf. Sample Agent Authorization Statement. All cats and pocket pets should be in a carrier and all dogs should be wearing a collar and leash. 5. Bring payment. There is a considerable cost to care for and rehome pets that are in our care. GBHS asks for a surrender fee to off-set those costs and to provide the best care possible for your pet. Any donations beyond that cost are greatly appreciated. GBHS accepts cash or credit card (no checks, except for donation purposes).